Mothers are beloved to us, their daughters and sons. But just on surname history alone, we can lose the gifts they bring. The point is made so well in classical Arabic personal names. For example, “Ibn Battuta” means “Son of Battuta.” Huh? What about the family name of the other half of the partnership that brought little guy into life? In Arabic cultures it's common to name the son in the father's line of names. However, Arabs could quickly point out that the loss of the mother’s family name applies in European languages as well. Right they’d be. Example: my father was named as Clarence Reeck, with no mention the family name of his mother, Michel. And, of course, I have no idea of my grandmother's original family surname. I just know that she married into the Michel family. We’ve just now see another example of loss of mother’s identity through marriage. Candidate Trump is known by his father’s family name, “Trump.” Someone in the family a couple of generations back showed true genius by changing the original family name, Dumpf, to Trump. Why didn’t someone change my family name to Reeck to Reich or Rich? Tremendous improvements! the Donald would certainly say. Point is: at marriage, women traditionally have been held to join the husband’s family, including name switching. 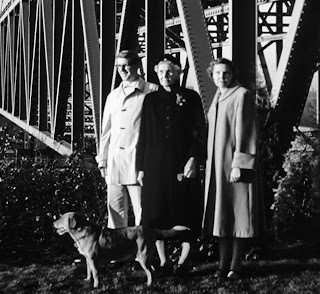 My grandmother Emma Colburn (Kalkbrenner), center, and my mother, Orleen, right. Me, left. Did my mother have a withering glance? She was known for that in her role as the front-desk school secretary. Supposedly she could peer down over the counter at one of the pesky kids that a teacher might send to her for discipline, and the kid would melt—just melt--on the spot. She was also known as very loving, loyal, hard-working, and musical. Many sides to her personality. To me, she was the disciplinarian and also my least judgmental parent. Dad (surnamed Reeck) was soft-hearted, very verbal, and a backyard farmer. Mom was the flower gardener. . .
. . .and she was a life-long Republican. However, when I ran for state representative as a Democrat she raised money and voted for me. That is loyalty. More name-loss history, switching to my wife's families. My wife’s mother’s name prior to her marriage was Williams. A terrific name, running all the way back to the illustrious Roger Williams, early civil rights hero and founder of Rhode Island. What a heritage switch when Madell Williams married Frances and became a Wonderly. 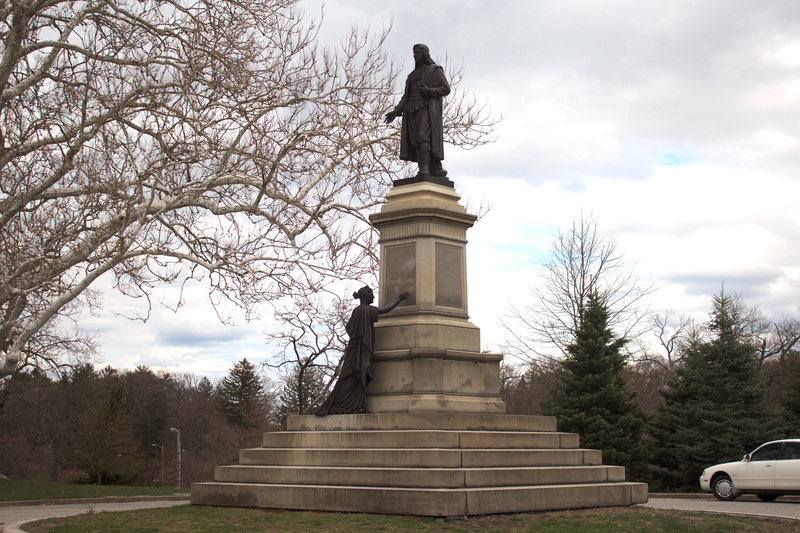 Roger Williams Monument , Providence, Rhode Island. But maybe the switch was a gain because Wünderlich (anglicized during registration at Staten Island to Wonderly) is a widespread German name royal heritage. Ach. . .why didn’t I take Lucy’s surname at marriage? Probably we could claim our Bavarian castle. Mothers bring truly great gifts and attributes to any culture—Asian, African, European, and other—and yet they surrender the source of their personal histories when they marry. So I want to be intentional and give thanks for my Colburn and Michel mothers, grandmothers, and further back into history. I give thanks for my wife’s Williams family and Wonderly mothers and grandmothers, and the gifts they brought into the present, rescued from history’s haze. I ask you: on Mother’s Day, May 8, 2016. I wonder how far back you can name your maternal heritage and values. Make a list of the values you’ve inherited from that line of women. You’ll join me in gratitude and praise of mothers--your mothers. I'm sure of it. To read comments, click on the blue comment button below the article. Ibn Battuta image reproduction notice: Approval for the use of this photo can be found at Dubai Construction Update Part 7 Page 12 at Post 223. Imre Solt's exact statement is: "I, Imre Solt, put all my images found on the Dubai Construction Update sites on the GFDL (GNU Free Documentation License). I agree to the terms that my images may be freely redistributed and used, that they may be freely modified (and modified versions may also be freely redistributed and used), that any redistribution must include the full text of the GFDL itself, that the work (and modified versions of it) must be attributed to me (the creator), and that the images can be re-used for commercial purposes (as long as the use is under the terms of the GFDL and that the full text of the GDFL goes along with the work). I acknowledge that I cannot withdraw from this agreement." He gave this statement on 17 August 2007. Thank you for this post. It is also meaningful since I know your daughter and wonderful Grand kids. I was going to ask you if you know anything about the last names of British Royals? Don't they change their name according to the position, ex Duke of Wales becomes crowned, then is it his son who becomes Duke of Wales? Are they all Windsors? It was also interesting that you mentioned a lot how some names got changed upon the entry in US or into English usage. It may be interesting to do an article on people changing the spelling of their names out of fear or persecution or other reasons of safety or survival. Anya, I know nothing about Brit. royals. Should be easy to do a computer search though. Your comment on people changing the spelling of their names is interesting. I know of one story in my own family of a fellow whose name was misspelled by an immigration clerk at Staten Island in the 1800's and it stuck! Thanks for your comment.